When a worn buggy axle is to be stubbed, proceed as follows: First, measure the length of the old axle. For this purpose take a quarter inch rod of iron, bend a square bend about an inch long on one end. With this rod measure from the end of the bearing, that is, let the hook of your rod catch against the shoulder at the end where the thread begins, not against the collars, for they are worn, nor should you measure from the end of the axle, for the threaded part is not of the same length. Now place your stub on the end of the axle and mark it where you want to cut it off. Cut the axle one-fourth inch longer than it should be when finished. Next heat the ends to be welded and upset them so that they are considerably thicker over the weld; lap the ends like No. I, Figure 6, weld and use sand, but if the ends should not be welded very well then use borax. These stubs are made of soft steel, and will stand a higher heat than tool steel, but remember it is steel. If the ends have been upset enough they will have stock enough to draw down on, and be of the right length. If this is rightly done one cannot tell where the weld is. Set the axle by the gauge, if you have one, if not, by the wheels. A gauge to set axles by can be made in this way: When you have set an axle by the wheels so that it is right, take a piece of iron 1 � x 1/4, six feet long, bend a foot on this about six inches long, with a leg on the other end. 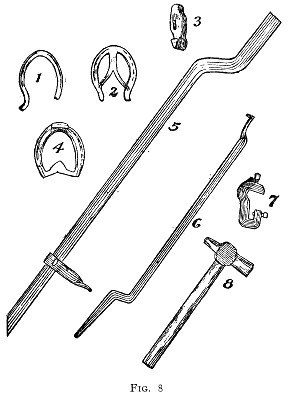 See NO.5, Figure 8; the leg to be movable and set either with a wedge or a set screw to fit for wide and narrow track. The gauge to be set against the bottom side of the axle. The pitch to be given a set of buggy wheels should be from one to one and one-half inches. I would recommend one and a half inches. This will be enough to insure a plumb spoke when the vehicle is loaded. It will also insure safety to the rider from mud slinging. By pitch, I mean that the wheels are one and a half inches wider at the upper rim than they are down at the ground. . Every smith ought to have a gauge of this kind, it is easy to make and it saves a lot of work, as there is no use of the wheels being put on and an endless measuring in order to get the axle set right. By gather I mean that the wheels should be from one-fourth to one-half an inch wider back than in front. Don't misunderstand me now Now I don't mean that the hind wheels should be wider than the front wheels, I mean that a wheel should have a little gather in front, as they are inclined to spread and throw the bearing on the nut, while, if they have a little gather, they will run right, and have a tendency to throw the bearing on the collars of the axle. If they do they will run more steady, especially when the axle is a little worn. A gauge for this purpose can be made like Figure 8, No.6. This gauge to be fitted to the front side of the axle when you make it. It can be made of I x J,( about three feet long, the forked end to reach the center of the axle. With these two gauges axles can be set right without the wheels.